In late 2004 when an Australian mum and her New Zealand partner named their son ‘Anzac’ a collective show of hubris clouded the intentions of the young parents from Melbourne. Angry veterans were reported to have flooded the phone lines of the Victorian Returned and Services League to protest. RSL state president Major-General David McLachlan insisted that the acronym had been used improperly, consequently “many veterans are unhappy this has occurred,” he said. Danna Vale, Australian Federal Minister for Veteran Affairs, initially acknowledging that children had been named Anzac after WWI, tempered this by saying “this was in the spirit of the times.” As the controversy teetered towards fever pitch Vale said she would speak to the RSL about what action could be taken to stop a child being christened Anzac. Fortunately the controversy was saved from extended debate following a Melbourne Herald Sun editorial siding with the parents, “how better to preserve the spirit of Anzac than to entrust it to the young.” After the newspaper conducted a poll in which 65% of the replies said parents were entitled to name a child Anzac, Major-General McLauchlan was reported to have “backed away” from Federal Minister Vale’s offer of intervention. Anzac, the kid with the neat name would have started school last year. I hope his name is heard. 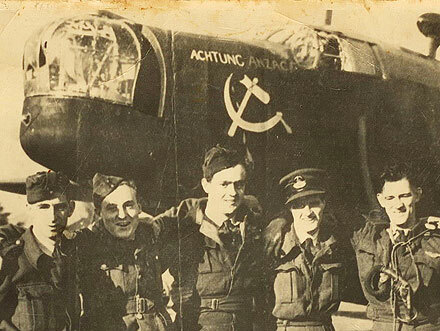 The use of the word Anzac is governed beyond traditional Trade Mark and Copyright controls. In Australia and New Zealand it has been protected from commercial use by legislation. It seems that both countries allow exceptions if advertising an event that occurs on Anzac Day itself, while legislation refers to ‘entertainment’ and in the Australian case, designated as a fund raiser, however I have seen plenty of ‘Anzac Sales’ advertised. Street names are generally exempt also, although it seems they should be near or contain a WWI or WWII memorial. …a number of would-be businesses attempted to capitalise on the situation by registering ANZAC for a wide range of products. By comparison with dried fruit, polishing preparations, coal and cigars the ANZAC Magic Grease Exterminator, attempted by Douglas Chinnery Brown of Auckland, at least showed some imagination. While these and many other applications went unapproved there was nothing to stop The Allies Hand Protector & Polisher proclaiming its product a New Zealand All-round Combination. 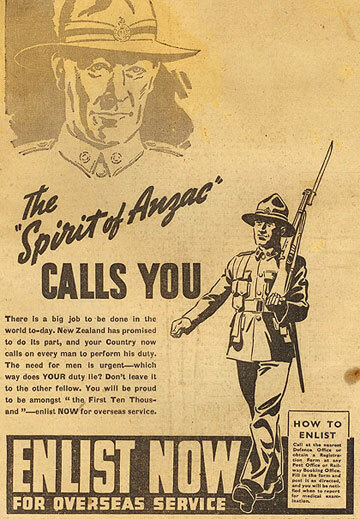 During WWII New Zealand recruitment posters drew on the fame and gallantry of our forebears by using the phrase “The Spirit of Anzac Calls You.” They weren’t alone in recalling the famous WWI exploits of Australian and New Zealand soldiers. 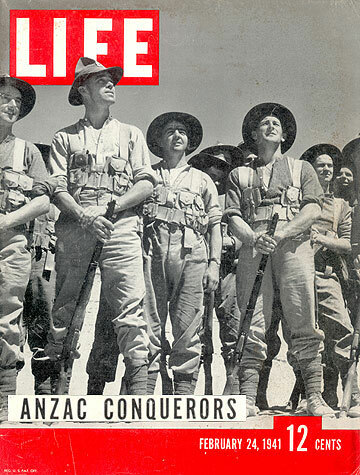 During the early years of the Second World War – before the entry of America – a 1941 Life magazine cover story profiled the Australian Imperial Forces and New Zealand Expeditionary Force in Egypt by introducing the “ANZAC CONQUERORS” to their readers. I’m not sure if the New Zealand actor Anzac Wallace was christened Anzac or if this is his stage name. Either way he has a great name and it looks so neat among a movie’s credits. 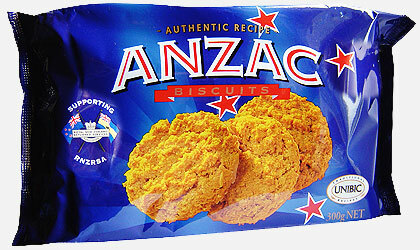 It should be noted that approvals for the word ‘Anzac’ to be used on biscuit products have been given provided that the product generally conforms to the traditional recipe and shape, is not advertised in any way that would play on Australia’s military heritage, and is not used in association with the word ‘cookies’, with its non-Australian overtones. For instance, an application for Anzac biscuits dipped in chocolate would not be approved as they would not conform with the traditional recipe. Such is the popularity of the Anzac biscuit that for more than a decade now the Australian biscuit manufacturer, Unibic, has had a fund raising partnership with the RSL in Australia and the RNZRSA in New Zealand. The Anzac biscuit has been packaged with the respective organisation’s logo. Such is the fundraising potential for New Zealand Returned Services Association welfare programmes that the partnership was launched in March 2002 by then Prime Minister Helen Clarke, aboard HMNZS Te Kaha while berthed in Wellington. This entry was posted in ANZAC and tagged AIF, Anzac, Anzac Day, NZEF. Bookmark the permalink. ← Who named the Anzacs? Hi there, I stumbled on this webpage from stumbleupon. It’s not something I would typically read, but I liked it. Thanx for creating something worth reading! Thanks – person named Cleopatra.